A window sticker at the birth of a baby is the perfect way to put the new family member in the sun, and welcome to the family. With a window sticker with the name of the baby share your good news with the entire neighborhood, and you can make a window sticker for each name. Is there a family member or close friend who is pregnant? Leave a window sticker for the baby maker with one of the cute, cute or cheeky motifs. You give the order, the name of the baby and birth order a sticker on the window. Of course you have to figure see the name. The fun of a window sticker for the baby is the possibility of providing it with any desired name. You're not limited to only the most common names. You can stand on the roof to shout it from the rooftops, but it's too dangerous. With a window sticker with the name of the baby you achieve the same effect, and you do not have to risk with no accidental fall. 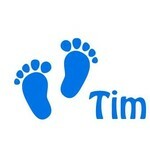 Just find a nice motif in the category window stickers for the baby and order a custom window sticker. You can easily stick on a window sticker. You just need to choose a clean window, stick on the window sticker and you're done. Later you can also easily remove the sticker without glue. The birth of the baby sticker is again re-use, such as the mirror in the baby's room.